Nurses know that phlebitis is the inflammation of the vein and is considered an adverse patient outcome. 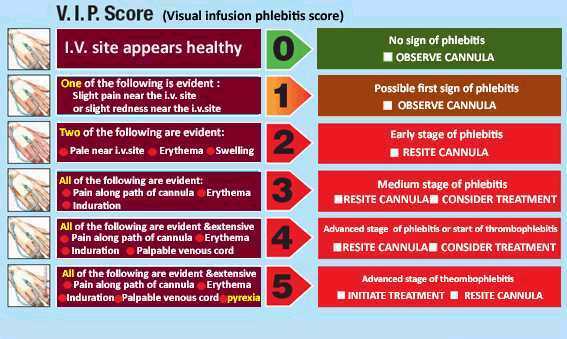 Vascular access sites should be routinely assessed for signs and symptoms of phlebitis , as well as the severity of phlebitis. According to the Infusion Nurses Society(INS) Standards of Practice, a standardized scale that is valid, reliable, and clinically feasible should be used. For the adult population, two phlebitis scale have demonstrated validity and reliability. One of the two scales is the phlebitis scale from the Infusion Nurses Society that many infusion nurses have used for years. Phlebitis resulting from peripheral IV’s should be monitored and the incidence should be calculated. A consistent, standard, and clinically feasible calculation based on point prevalence should be use to monitor phlebitis rate. So next time you find yourselves looking at an arm with possible phlebitis, use a phlebitis scale to assess and document the severity of your findings! No guessing required…. For more information or to purchase the 2011 Infusion Nursing Standards of Practice, click here.